Logbook charter holiday Greece, part four - Sailing vacations and yacht charters. This time we chose to go from Athens on a one-way bareboat charter to Milos (last two weeks of May). This is part four of the logbook that describes this adventure. Click on the thumbnails to see a larger 800x600 photo in a new window. When we got up before dawn there was not a breath of wind, which was ideal since we planned to negotiate the very shallow Anti-Paros Channel. With trepidation we entered the channel at a 190° course dead slow ahead and saw the depth-sounder counting down to ... 5 metres. As soon as we had the islet of Remmatonisi abaft, we changed course to 210° for the most disquieting section of this passage ... 3.2 metres. But finally it got deeper again, now even a depth of 7 metres was considered quite lavish. Once we had we cleared the channel a dark front moved in and in just 20 minutes the wind rose from 4 knots to 28 knots, while a series of thunderstorms went right past us. It was quite an ordeal, but we arrived in a sunny Ios port, where puddles of rain still glistened on the quay. The prospect of sailing to Santorini and within its flooded caldera woke us up early and we were the first to leave port. There was a little haze but soon Thira and Thirasia could be made out against the horizon. The approach was magnificent (see photos below), although the dolphins that we had hoped to see were apparently entertaining other sailors elsewhere. We had already one rope on the mooring buoy underneath Fira (see photo below), when suddenly two forbidding men approached us in a dinghy. They demanded in unintelligible English €20 for use of the buoy, which was obviously a con-trick and somehow we waved these swindlers away. Yet, two minutes later they reappeared with a similar bloke clad in some sort of army uniform, but without any insignia. Moreover, he was carrying a gun !!! We left at once and sped away at full throttle. When twilight came down we arrived at our “port of refuge”; the unfinished marina of Vlichada. To avoid the ancient breakwater - which is fully submerged - we first steered a 45° course towards the western chimney, then due east towards the outer mole of the marina. Again we rented scooters - now from “Mikes Bikes” who actually delivered these at the quay for us - and transformed into terrible tourists, we enjoyed all the mandatory major sites of Thira. Afterwards, because of my birthday, I treated Laura and Michiel to a dinner at the friendly Limanika Taverna beside the marina 0286-82819. The wind was forecast to be 15-20 knots for today and 30 knots for the day ahead. So, before we decided to leave this lee-shore we climbed up to study the winds and sea state outside the marina. What we saw was extremely disturbing: we witnessed an approaching charter yacht closing in on the ancient breakwater fast and subsequently hit it in the confused seas. For a moment it leaned forward and came to a complete standstill (see photo below). Then a high wave lifted the yacht up and dragged it over the stones, after which it limped to the safety of the marina. When the conditions improved, we left port (avoiding the dreaded breakwater) and started the close-hauled leg to Folegandros. Halfway, the situation developed into some real “heavy weather sailing”. Not only the wind increased but also a 2 knots current started to run against us. We reached the port of Karavostasi in good order, though very salty, and took the yacht stern-to the end of the deserted quay. After a well deserved good night's rest we took the island's only taxi to the Chora, which we feel is one of the most beautiful in the Cyclades. In the afternoon we lifted anchor in very agreeable conditions and witnessed some textbook examples of wind convergence along the north of Folegandros. We played these shifts well and arrived at Manolisi - west of Poliagos - shortly before dusk. The yacht was anchored south of the sandbar in lovely secluded surroundings. The area enclosed by Kimolos, Polyaigos and Melos has a very distinctive character. Especially in the north it's rather shallow - mostly less than 20 metres, yet cargo vessels are abundant here and seem to appear out of nowhere and subsequently vanish behind islands and headlands. Although the vast Melos bay is clearly an ancient caldera, it lacks the steep cliffs of Thira, which made such a lasting impression on us. We moored the yacht stern-to the Adhamas promenade and rented bikes to cycle all the way up to the lovely Chora. The evening was made complete with some good Italian dishes on a narrow balcony overlooking our yacht. Restaurant Aragosta 0287-23478. This was our last day on the Galaxy and we rose early to get her shipshape. In retrospect we can say that this adventure had it all: beautiful beaches, dolphins, submerged breakwaters, temples, guns, thunderstorms, sailing in the Santorini caldera, secluded anchorages, loads of H2S, octopus encounters, etc and all this with a group of dear friends sailing in Greece. The ancient Diolkos and the Corinth Canal. 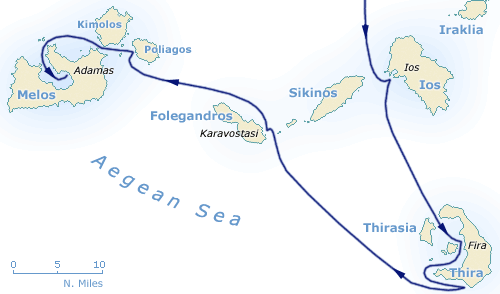 Sailing in the Saronic and Argolic gulfs. Sailing in the Cyclades Islands. Further reading: Indispensable books about (sailing in) Greece.